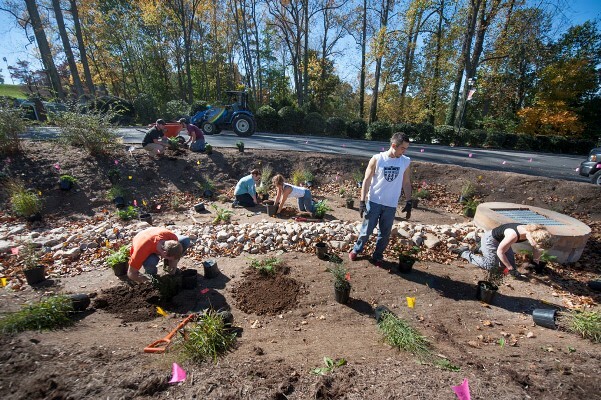 Capturing and cleaning stormwater runoff is an increasingly important way to improve water quality in rivers and lakes, and University of Lynchburg is installing a $65,000 biofilter and rain garden that will help protect Blackwater Creek and the James River. 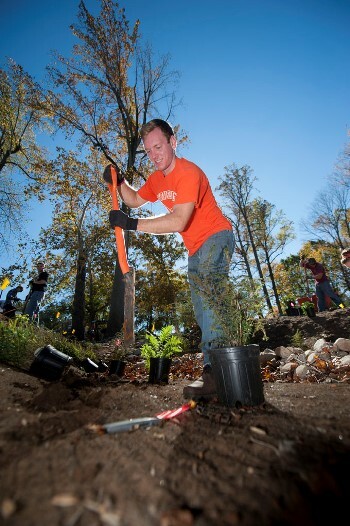 Dr. Tom Shahady, professor of environmental science, proposed the project, which is providing hands-on learning for students this fall as they plant a rain garden near the Lakeside Drive entrance to the college. “This project improves rainwater coming off the steep grade of the new loop road around the Drysdale Student Center, as well as the main driveway,” Dr. Shahady said. “The aquatic plants we put in the pond, in addition to two biofilters, will infiltrate the stormwater instead of discharging it directly into Blackwater Creek.” Infiltration of stormwater into groundwater is the best treatment available. Two biofilters, composed of mulch, rocks and sand, will pretreat the water before it reaches the pond, where aquatic plants will absorb nutrients and prevent their escape to Blackwater Creek. Excessive nutrient loads are one of the biggest pollutants in Virginia’s rivers and lakes, as well as the Chesapeake Bay. Rob Smith, LC’s director of buildings and grounds, said there may be the occasional heavy rain event that overwhelms the system, but it will be a huge improvement over current conditions. “In 90 percent of the storms, it’s going to filter the water,” he said. This commitment to cleaning up the water will have ongoing costs, Smith said. The biofilters will likely need to be replaced about every seven years, at an estimated cost of between $7,000 and $8,000. Two Rain Guardian turrets, which capture trash, will have to be cleaned out regularly. They represent brand new technology suggested by Erin Hawkins, the city’s water quality manager. Hawkins said she learned about the turrets at the annual Environment Virginia Symposium at Virginia Military Institute. They were developed by a soil and water conservation district in the western US, she said. Hawkins said LC’s project sets a good example of innovative ways to decrease stormwater runoff. She said the project is unusual because it’s one of the first voluntary rain gardens of its kind in the city. The cost of the project will be offset by a $114 reduction in the College’s stormwater fee, which is currently $2,000 a month. LC also hopes to use a Jessie Ball duPont green revolving fund for the purchasing of all the planting material, Smith said.